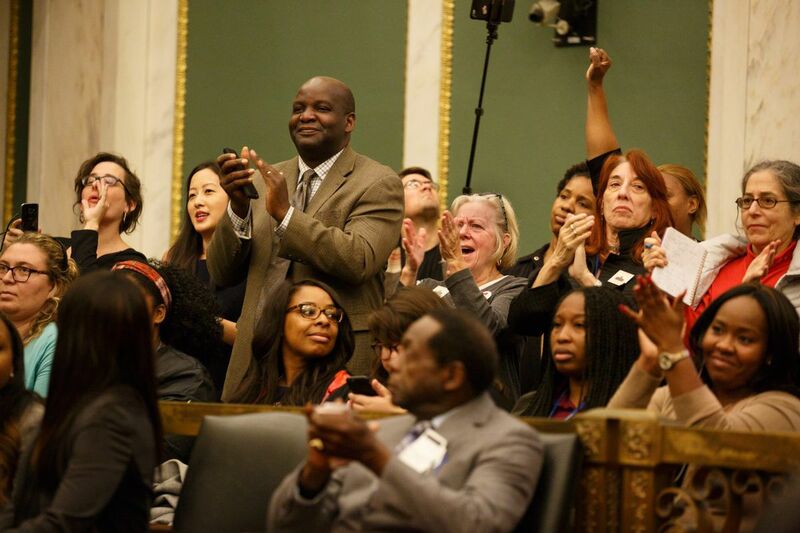 crowds in City Council react after Mayor Kenney announces that the 16-year SRC experiment is ending. Steven Scott Bradley, Chairman, African American Chamber of Commerce of PA, NJ & DE: "The return to local control under a mayor-appointed board provides a chance to end the tension between charter and traditional schools. As Philadelphians, we must all be focused on creating quality schools, and not focused on whether those schools are charter or traditional District-run schools. I know Mayor Kenney is committed to the goal of providing all children of color a quality education and the business community will continue to support this pursuit." Kendra Brooks, Philadelphia parent, member of Our City Our Schools coalition: "Ultimately, we would like a fully elected school board. The fight is never over." Sharif El-Mekki, founder of The Fellowship-Black Male Educators for Social Justice, principal of Mastery Charter-Shoemaker Campus: "With a local, mayor-appointed school board, Philadelphia has an opportunity to turn the tide and assertively pursue a just and equitable education for its students, thus improving the quality of life for our communities. While we should aggressively pursue justice for Pennsylvania's lack of an equitable budget, we can't wait to pursue other solutions as well. These solutions should include local control and accountability for exercising this control. Ultimately, the voices of those most impacted should always be at the table." David Hardy, founder of Boys' Latin of Philadelphia Charter School and board member, Philadelphia School Partnership: "I'm hopeful. I want to see someone take responsibility so when we fail children, someone is accountable." Lisa Haver, retired Philadelphia teacher, founder of the Alliance for Philadelphia Public Schools: "Yes, we need more money, but this is an opportunity to re-evaluate our spending priorities." Superintendent William R. Hite Jr.: "I will continue to advocate for the resources that will increase the successes, stability and positive momentum we have been able to achieve as a School District. I am optimistic and excited about the future of the School District of Philadelphia and about our work to improve academic outcomes." State Sen. Vincent Hughes: "It's a bold plan. It follows through on his commitment to bring the school district back under city control, consistent with the legal cases going through the Supreme Court right now. The state has dropped the ball dramatically on generations of Philadelphia school children and low-income school districts across Pennsylvania." Jerry Jordan, President, Philadelphia Federation of Teachers: "The PFT has been fighting state control of our schools for the past 17 years. With today's announcement, Mayor Kenney is demonstrating his commitment to public education and to local control of schools that earned him the endorsement of our union and the support of Philly's educators." Mollie Michel, district parent: "A quality education is the cornerstone of a successful, productive life. My kids, and all of Philadelphia's children, deserve the best educational opportunities from pre-K to high school. A return to local control under a Mayor-appointed board is the best chance our kids have to attend thriving schools and receive a top notch education that will allow them to realize their dreams." Stephen Miskin, spokesman for Harrisburg House Republicans: "It is refreshing to hear the mayor wants to take full financial and academic responsibility for ALL the public schools in Philadelphia. Because this is really union-driven, parents and students may still have reason for concern about the fate of successful renaissance schools, turn-around schools or charter schools…We wish the mayor well and hope this really does benefit students and parents." Jerry Sweeney, President, Chief Executive Officer and Trustee, Brandywine Realty Trust: "In order to achieve long-term sustained growth, retention and overall vitality for Philadelphia, both life-long Philadelphians and newcomers to our city must feel confident that our local schools will offer their children a strong education in a safe environment. It is imperative that we transition to a system that is controlled locally by our mayor and his appointed board members to ensure strengthened alignment and uniformity of purpose between the school board and the administration. As a result, the city will be better positioned to achieve successful outcomes for public schools." Reverend Dr. Alyn E. Waller, Senior Pastor, Enon Tabernacle Baptist Church: "Too many children in this city don't have the chance to break the cycle of poverty because they don't have a quality school in their neighborhood. I know Mayor Kenney is committed to achieving this goal for our children – he has already shown that commitment through pre-k and community schools. With a return to a local board with mayoral appointment and ratification by City Council, Philadelphians will have one, central point of accountability for providing all our children access to opportunity." SRC Chair Joyce Wilkerson: "On November 16 a resolution will come before the SRC which would take the first step in a process to bring local control of the School District back to Philadelphia. Strong public education is the most significant factor in the welfare of our city and the future of our children. It is time for Philadelphia to take ownership of that future." State Sen. Anthony Hardy Williams: "The SRC was created for a fiscal crisis, not a performance crisis. So the question would be: Has the fiscal crisis ended? After three years of a balanced budget, I guess that would suggest that is has. That would allow us to have the conversation within the context of the law. That's what we're using. Now the reality is, politically, there has been a long desire and a waiting moment for us taking back control of our own school district. And I think those two things converged with the perfect timing. We have the right governor and the right mayor."